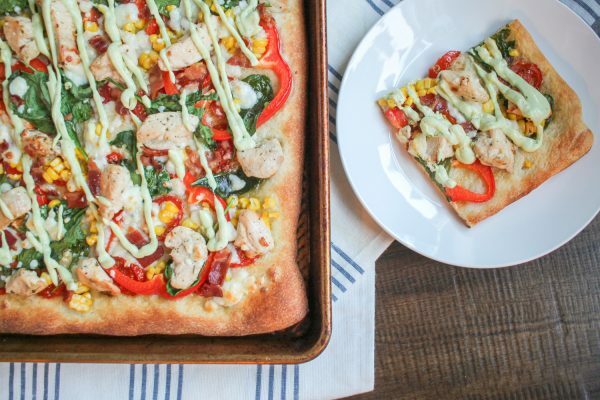 This Bacon Ranch Chicken Pizza uses fresh summer produce to make a unique but delicious pizza. 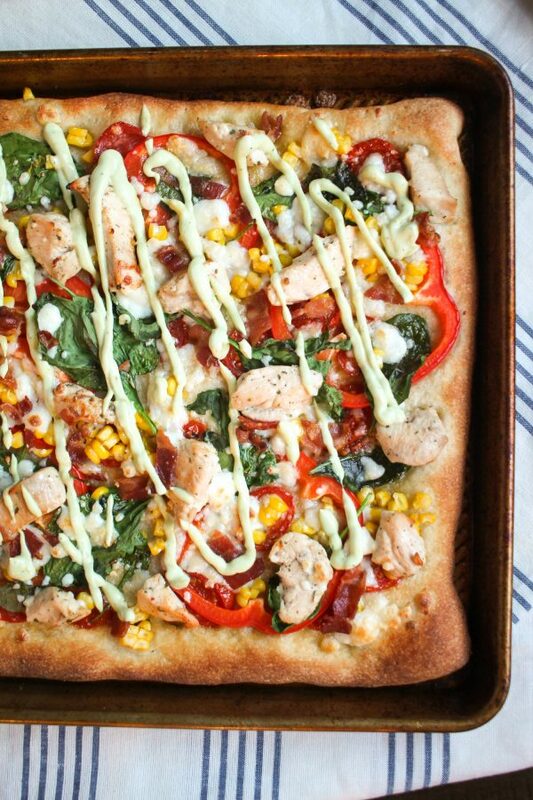 A store-bought pizza crust is topped with roasted tomatoes, grilled corn, spinach, bell pepper, ranch seasoned chicken, bacon, and queso fresco and then drizzled with an avocado ranch dressing. It has a lighter and more refreshing taste than most pizzas. It is a dinner that comes together quickly and easily, and Charles absolutely loved it. One thing that I have learned from living in Chicago is that Midwesterners love to put ranch dressing on their pizza. Even I have been doing it – I have found that ranch is especially delicious on Jet’s cheese pizza. This recipe is inspired by two things, the trend of putting ranch dressing on pizza, and my love of tacos. I grilled fresh corn on the cob to add to the pizza, but you could certainly use canned or frozen corn if you want to save yourself some time. Instead of a tomato sauce, I added roasted tomatoes and a homemade avocado ranch dressing to this pizza. If you want to give the pizza more of a taco flavor and a touch of spice, you could use salsa instead of roasted tomatoes. This meal comes together in less than 45 minutes. First, you roast the tomatoes and cook the bacon in the oven. During that time you prepare the chicken. The chicken was seasoned with ranch dressing mix and quickly sauteed. 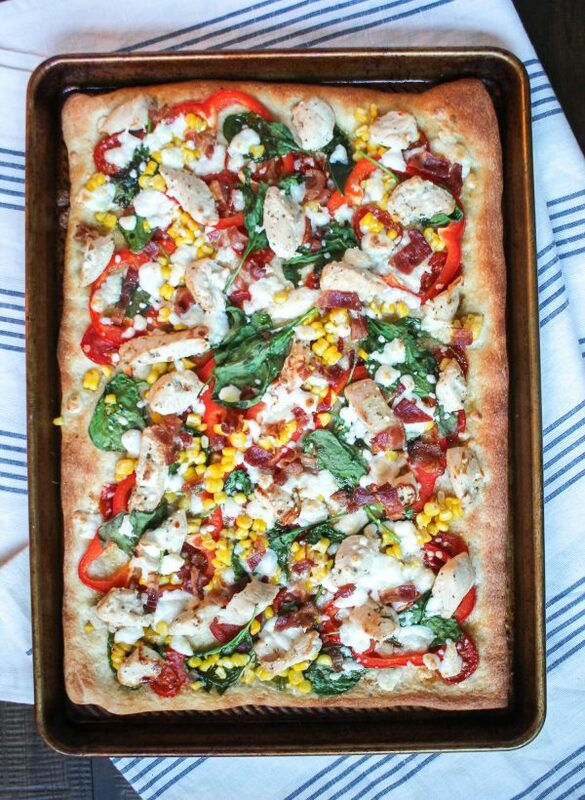 The roasted tomatoes, bacon, and chicken get layered on a pizza crust with spinach, cheese, corn, and red bell pepper. 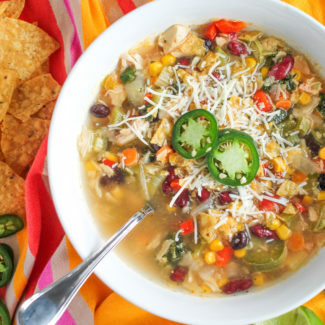 It’s a bold flavor combination perfect for summer. 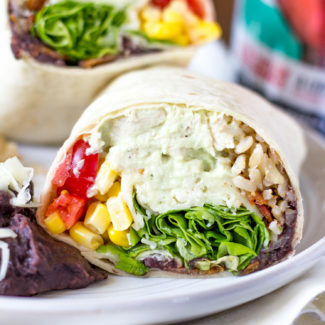 I have used my recipe for avocado ranch dressing again and again. It’s super simple. 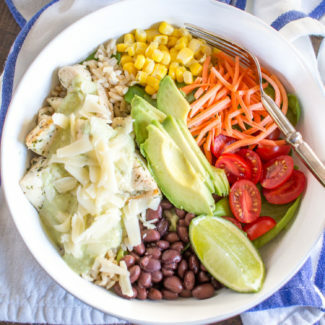 It is made in a blender, and I love how the avocado adds creaminess to the dressing. The only thing to know about this dressing is that since the avocado will brown you can’t make this ahead of time. First, cook the corn. I recommend grilling it. Heat a grill to 400 degrees and place the corn - still in the husks - right on the grill. Cook for 20 minutes, turning the corn a few times. Remove from the grill and let cool. Then, roast the tomatoes. Heat your oven to 375 degrees. Slice the tomatoes and place them on a parchment-lined baking sheet. Drizzle a little olive oil over the top, and sprinkle with salt and pepper. Bake the tomatoes for 15 minutes. Next, cook the bacon. Heat your oven to 400 degrees, place the bacon on a baking sheet lined with aluminum foil and bake for 12 minutes. You don't want the bacon to get too crispy since it will cook again on the pizza. Let the bacon cool and then chop. While the bacon is baking, cut the chicken breasts into bite-sized pieces and place them in a large ziplock bag. Sprinkle 1 tablespoon of dry ranch dressing over the chicken. Seal the bag, and shake the chicken around to evenly distribute the ranch seasoning. To cook the chicken, heat 1 tablespoon olive oil in a skillet over medium heat. Place the chicken in the skillet and let cook for 2 minutes, until slightly browned, and flip the chicken over. Cook for another minute. Then cover the skillet, reduce heat to low, and let cook for another 8 minutes. 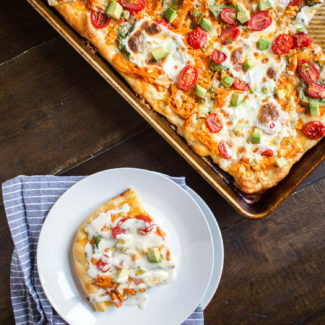 Grease a sheet pan with butter, and roll out the pizza crust. Brush the pizza crust with olive oil. Spread the tomatoes on top. Slice the corn off the cob and season it with a teaspoon of butter and a touch of salt. Then add it to the pizza. 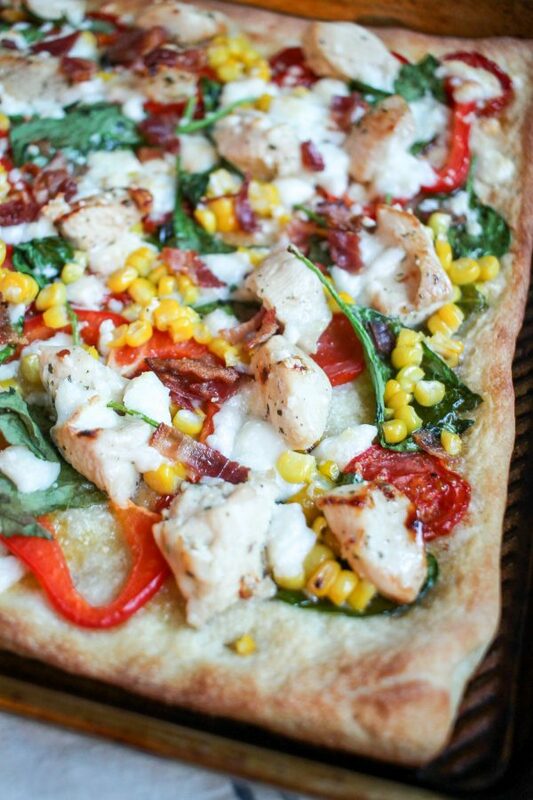 Layer the bell pepper, chicken, spinach, bacon, and cheese on top of the pizza. Bake the pizza for 15-20 minutes, until the cheese has melted and the crust is starting to brown. I like to finish the pizza by cooking it under the broiler for 1-2 minutes to help it get extra crispy. 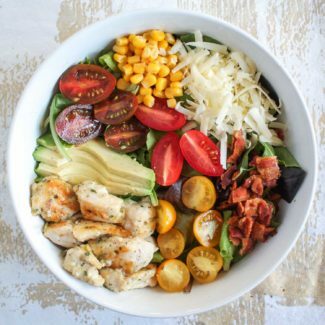 While the pizza is cooking, prepare the dressing. Place all of the dressing ingredients in a blender and liquefy. Add more water if the dressing is still too thick. 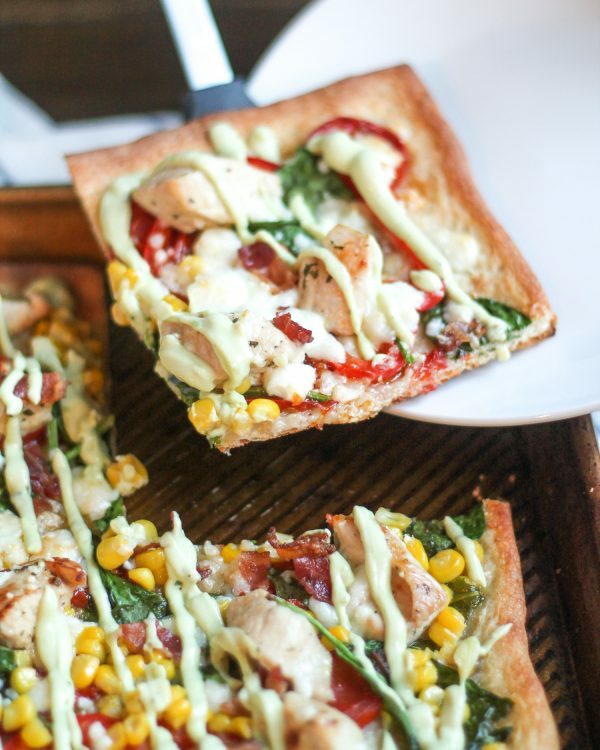 Once the pizza has cooked, serve it with the avocado ranch dressing drizzled over the top. 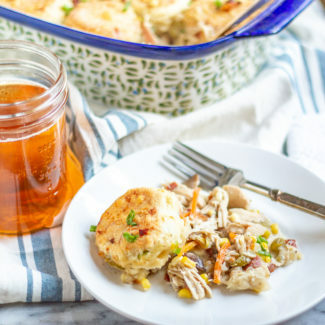 If you love chicken, bacon, and ranch I have two more recipes for you to try. 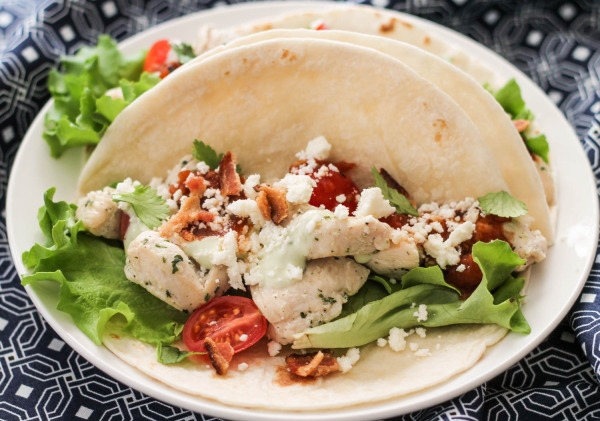 The first is Ranch Chicken Tacos. 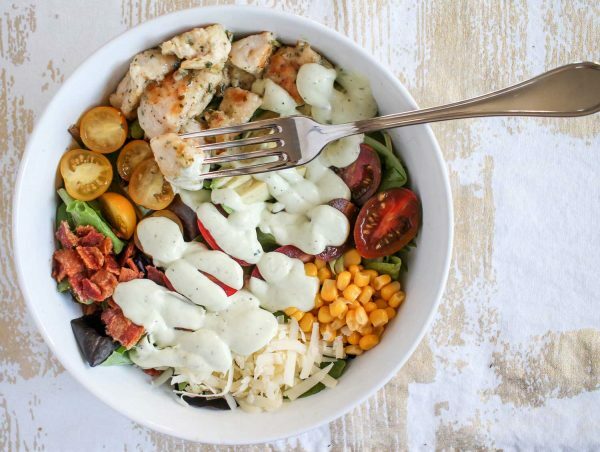 The second recipe is for a Ranch Chicken Cobb Salad.